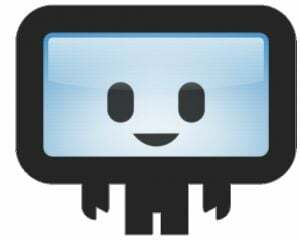 Any rumors Hearts of Iron IV would get delayed again have been squashed. June 6, 2016 is now the official release date since last week when the grand strategy game became available for pre-order. It starts at $39.99 for the Standard "Cadet" Edition and works up to $60 for the "Field Marshal Edition." As of writing, Green Man Gaming now has the game on its site with a 25 percent off Hearts of Iron IV deal. That gets the Cadet Edition down to $29.99, the Colonel Edition down to $37.49, and the Field Marshal Edition to $67.50 -- all with the same pre-order bonuses as Steam and elsewhere. As with most Paradox games, all you need is the standard edition to play the game. However, if you want your units to look more historically accurate and flashy, an upgrade may be in order. The Colonel Edition is the base game with a Colonel forum icon for the Paradox forums (yes, seriously), a wallpaper, and most importantly six cosmetic packs. The cosmetic packs are almost entirely focused around tanks, of which you get eight unique tank models in the game per pack. The Field Marshal Edition is going to set you up pretty for the future. Hearts of Iron IV, as with all Paradox titles before it, will have multiple expansion packs. 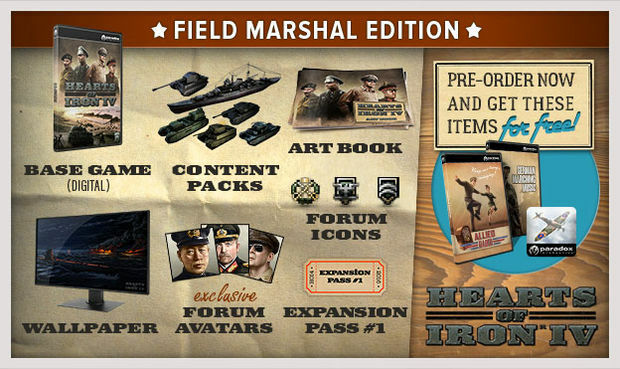 Included in the Field Marshal pack is what's dubbed the "Expansion Pass #1" which will include the first two expansions yet to be announced by Paradox. The estimated value of these packs is $49.99, meaning they'll roughly cost $24.99 a pop. Other than the expansion pass, you'll get a few other digital goodies. Paradox forum goodies include a Field Marshal icon and a unique avatar. Also inside the Field Marshal digital box is an art book featuring some of the concept drawings. Which edition you should get depends on how much of a fan of the Hearts of Iron series you are. If you know you're going to buy the expansion packs the day they come out anyway, go with the Field Marshal and tack on the savings. If you'd like to try it out first before going all out, stick with the Cadet and save a few bucks. Update: Field Marshal edition has been updated to list price of $90. Coupon % discount above has been adjusted accordingly.